Remember last week when I made that Coconut Tea Cake in the bundt pan, and I whined about how my "nonstick" bundt pan was no such thing? Well, dear Leslie suggested that I coat it with shortening, then nonstick cooking spray, then flour. Aha, I thought to myself, not one, not two, but THREE elements that prohibit stickiness! This plan cannot fail! Any guesses as to what happened next? Look at it there, smirking at me with its stupid smirky bundt face. Now, I'm no bundt technician. I didn't major in Bundt Studies in college (choosing instead the only slightly more helpful American Studies, ah, the liberal arts! Producing bitter temp workers by the thousands) but I am sort of a ninja when it comes to covering up my kitchen mistakes. So I got crafty with a soft plastic knife, and ever so delicately massaged the remaining cake back together in an approximation of its original shape. 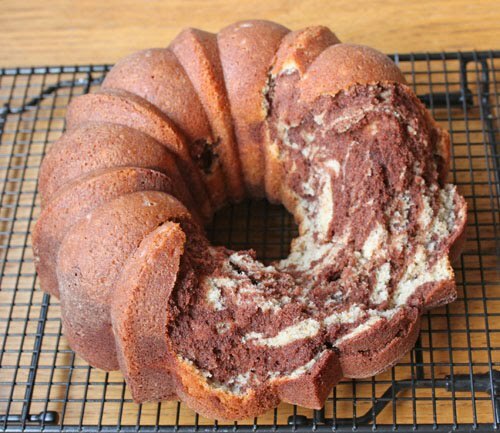 I had originally made a chocolate sauce to serve alongside the cake, but once I saw the sorry state of this bundt, I knew there needed to be a more drastic cover-up. Fortunately, the sauce I made was Sherry Yard's 10-Year Chocolate Sauce*, which actually works moderately well as a poured icing, so I heated it until it was very liquid and poured it over the cake. Success! No one would ever know what horrors lurk beneath. *Please make this sauce. It is outrageous. A wonderful texture, and a great tangy taste (I used sour cream in place of creme fraiche.) It was a bit thick to pour, but if the cream was increased by a few tbsps it'd be perfect. Or you could omit the cream to thicken it and have an awesome spreadable frosting. Love. A word of strategy if you're ever in the same situation: put the cake on a cardboard round! It was way too unstable to handle the glazing and transferring to a serving platter, so I scooted a round underneath it and trimmed it at an angle so the cake hung slightly over the edge. You can't even tell from the pictures. See, what'd I tell you? Ninja. 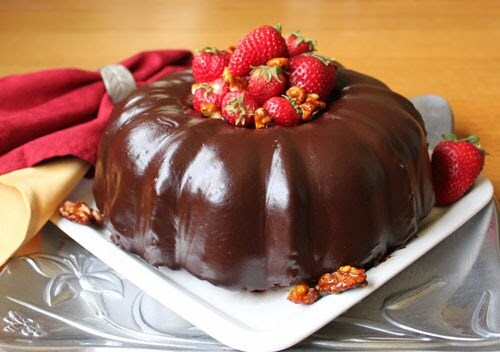 To complete the deception, I piled the bundt high with fresh farmer's market strawberries and candied walnuts. I actually put a shot glass in the center of the cake and then just put berries on top for the photo, so there weren't strawberries piled all the way down into the center. It's an illusion. Also, I'm not sure why I'm suddenly compelled to unburden all of my deep dark baking and photographing secrets. Maybe I shouldn't have had that Truthiness Tonic at lunch. I didn't make the mocha version, mine was just a chocolate-vanilla cake. And I got a little crazy adding the chocolate, so the marbling suffered a little bit. Next time I'll keep more batter plain, and exercise more restraint with the swirlin' knife. We had this cake for Easter dessert, along with the rest of the chocolate sauce, fresh strawberries, the candied nuts, and my very favorite homemade vanilla-honey ice cream (recipe under the cut). We both loved this cake, but I think it really helped that it was covered with chocolate frosting and sauce, and served with so many extras. On its own it seemed a little plain and unexciting, but it got by with a little help from its friends. Now if you'll excuse me, I have a bundt pan I need to go karate chop. Break the eggs into a medium-sized bowl and lightly whisk them. In a saucepan over medium-low heat, stir together the sugar and half-and-half. When the mixture begins to simmer, remove from heat, and whisk half of the mixture into the eggs. Whisk quickly so that the eggs do not scramble. Pour the egg mixture back into the saucepan, and stir in the heavy cream. Continue cooking over medium-low heat, stirring constantly, until the mixture is thick enough to coat the back of a metal spoon. (I always use a thermometer--175 degrees F is the magic number.) Remove from heat, and whisk in vanilla. Pour into a bowl, cover the top with cling-wrap, and refrigerate until completely cool. Pour cooled mixture into an ice cream maker, and freeze according to the manufacturer's instructions. Notes: You can omit the honey and use 1.5 cups of granulated sugar. For a stronger vanilla flavor, use 1 vanilla pod, scraped, and reduce the vanilla extract. Also, this makes a DELICIOUS cinnamon ice cream! Simmer the half and half with 1-2 cinnamon sticks, and/or add ground cinnamon at the end with the vanilla. So. Good. you do work wonders with a bundt cake, liz. 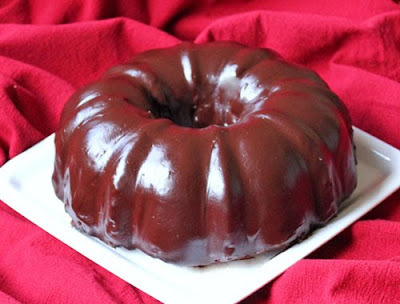 dr pepper bundt has never been happier to see you! did anyone suggest you buy a new bundt pan? 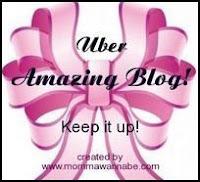 Nice recovery Miss MacGyver of TWD! Well, after that cake was coated in that amazing looking frosting, no one would ever know you had a battle with the bundt pan. Beautiful job. So elegant in the end! Bravo! Oh no! I think your bundt pan should be banished to the basement or attic or wherever bad kitchen tools go to die. If I didn't know what you went through to make this one a success, I would have thought it was another fabulous result for you. Knowing how you snatched victory from the jaws of defeat makes it even sweeter. You did an amazing job putting that cake back together! 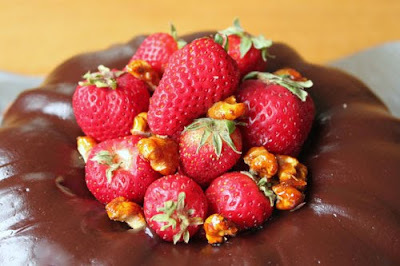 Thank you for sharing the recipes for chocolate sauce and vanilla-honey ice cream as well as your strawberry trick! Great save! The chocolate looks awesome, I must try it. I think your pan is possessed--get rid of it! Thanks for making me smile this morning. Wow, your bundt turned out looking amazing and that sauce looks absolutely to die for! That icing looks amazing! Wow!! wow! that's an amazing cover-up! awesome job, you rock. Wow - a gold mine of trade secrets here!! I'm thinking that the problem has got to be your pan. I use a le forme pan (marketed as a kugelhopf pan, but looks like a regular 'ol bundt pan to me) and just coat it with some Baker's Joy or Baking Pam or something similar, and have never had a problem with getting the cake out (and believe me, I usually have a problem if there is a baking problem to be had). 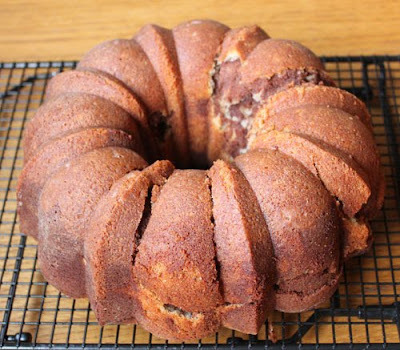 Anyway, maybe a nice new Nordicware bundt pan is in order for you? Or maybe not, what with your impressive post-cake removal magician skills and all. Your cake is GORGEOUS, and I would never know that you had any kind of problem! that bundt pan is a jerk! but you are a total ninja and master of disguise! Time for that bundt cake pan. to. go. I use one I found at a garage sale (it is almond colored which makes think it is someone's early 80s reject) and it doesn't cause this many problems. That frosting, however, looks like a SERIOUS improvement. yu-um. Nice recovery! You're a pro, so you need to show that bundt pan who's boss!!!! Great looking cake..you covered up the messy part so well! I saw this happened to a few people. That's why I don't have a bundt. :) It turned out gorgeous!!! Love the post. You had me laughing. I love your mad ninja skills. I think you should take the bundt pan and run it over with your car. That is a totally amazing transformation!! So sorry about your stupid pan, arrggh! Been there done that. UGH. I finally bought a new one several months ago and have made a few flawless bundts since then, yay! Baker's Joy, Baker's Joy, Baker's Joy!! I cannot tell you how many bundt cakes I ruined/turned into trifles before trying this. Nice save with yours--it's gorgeous! You did an amazing job covering up the "mistake." My bundt pan ripped this cake too, but I had good luck with the Coconut Tea Cake. And I concur with Jen...Baker's Joy is a wonderful thing. I keep two cans on hand, just in case! Thanks for revealing your secrets! But really, I think it's time for a new bundt pan. I'm headed over to check out that chocolate sauce! All I can say is Wow! You did an amazing job of covering up a damaged bundt cake. I use cake circles all the time, but didn't know about the shot glass. Great tip!! 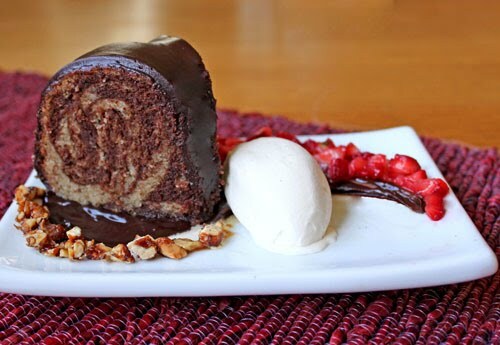 And, your finished bundt cake looks fabulous!! You are truly the queen of covering up. 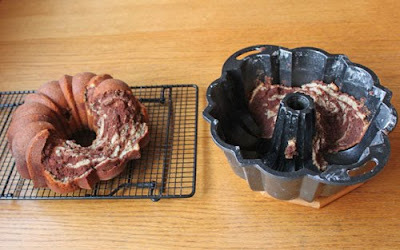 Even after knowing the problems you had, I can't believe it's the same bundt. 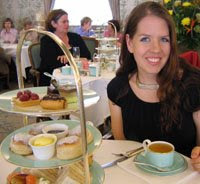 Oh and PLEASE do a tutorial on how you got the glaze to look so perfect! I love the fact that you completely disguised your cake. I am in awe of the fact that the chocolate was perfectly smooth. Great job and thanks for baking with me this week. Your bundt pan can join mine in the bundt pan cemetery! Great repair job on the cake--it looked fantastic after your wizardry! I hate smirky bundt faces! Your cover up is clever, and that sauce looks amazing!! LOL, Go Ninja Liz! 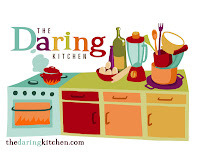 Please share more secrets, makes us lesser baking mortals feel human. If you hadn't have said anything we would have thot that cake was absolutely perfect. But even with the smirky cake it is absolutely beautiful. More tips please. You ROCK!!! It looks so good with that icing! Maybe it's a good thing you had to put it on he he.. THE MOUNDS BROWNIE. YES, IN ALL CAPS.